The International Foundation's longstanding relationship with the Wharton School brings prestige and excellence in education to you. Spanning over 35 years, the alliance has resulted in the distinguished Certified Employee Benefit Specialist® (CEBS®) designation as well as high-quality investment programs. The Wharton School, founded in 1881 as the first collegiate business school, is recognized globally for intellectual leadership and ongoing innovation across every major discipline of business education. As one of the most comprehensive sources of business knowledge in the world, Wharton bridges research and practice through its broad engagement with the global business community. Formed through in-depth, groundbreaking academic research and extensive industry experience, Wharton executive education programs offer a supportive and challenging context in which participants gain the skills necessary for their next level of executive development. Wharton's Aresty Institute of Executive Education serves up to 8,000 mid- to senior-level executives annually. Through partnership programs, International Foundation members have the opportunity to engage with faculty who are the most cited, most published faculty of all top-tier business schools. With a profound influence on global business, Wharton faculty members are the sought-after, trusted advisors of corporations and governments worldwide. Held annually at Wharton campuses, select investment management programs are offered to International Foundation member trustees and other benefit professionals with varying levels of knowledge and experience. Wharton's skilled educators and researchers, award-winning authors and leading authorities in the investment management field teach and/or oversee the curriculum of the investment programs. Educational Program Director Tiffany Ulbing introduces these Investment Management Programs. ​The Foundation and Wharton continue to provide a stellar investment program. The curriculum and faculty present real-world information that I can take home and apply immediately. There is no doubt I will be a better trustee because of it. Since the inception of CEBS in 1977, the International Foundation has been privileged to partner with the Wharton School. This unique partnership distinguishes CEBS and its university-based curriculum from other total compensation designations. In its partnership role, the Foundation is responsible for program administration, and the Wharton School is responsible for all academic standards including curriculum design and examinations. 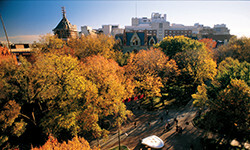 Classes are held at the Steinberg Executive Conference Center on the University of Pennsylvania campus. Lecture rooms offer a state-of-the-art, comfortable environment conducive to adult learning. Breakout rooms allow for small group discussion. Direct interaction with faculty is encouraged and aided by the limited class size. Classes are held in a state-of-the-art educational facility designed to facilitate the learning style that Wharton has pioneered. Wharton | San Francisco is conveniently located in San Francisco's business and financial district, in the historic Hills Bros. Building. Programs at Wharton | San Francisco draw their faculty and courses from the same world-renowned resources available at Wharton's Philadelphia campus. For program content, contact Adam Abelson at (262) 373-7676 or adama@ifebp.org. Educational sessions at this program may qualify for CEBS Compliance credit. Visit www.cebs.org/compliance for more information.